The beautiful Gili Islands, which are actually part of Lombok, are frequently visited by people visiting Bali. 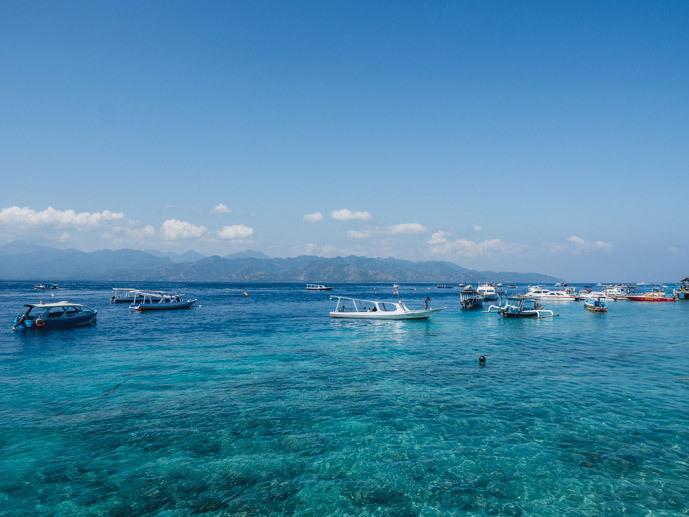 And although they are definitely a great addition to your Bali itinerary, there are a few things you should know to help you plan the best trip to the Gili Islands. So how to get to the Gili Islands from Bali? Here is exactly how we did it, our first-hand experience and alternate options. We also have a video of our journey on how to get from Gili Trawangan to Padang Bai, Bali. How to get to the Gili Islands from Bali? 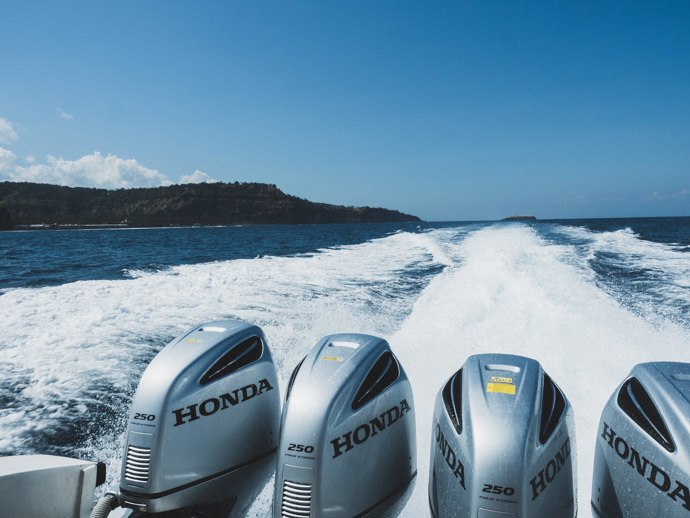 Getting a fast boat from Bali to the Gili Islands is the most straightforward option. 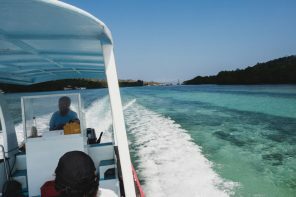 The boats leave from a few different areas in Bali, and depending on which company you choose, can take you to Gili Air, Gili Trawangan or Lombok mainland. Our favourite fast boat company is Blue Water Express. So how long does it take to get to the Gili Islands from Bali? Depending on where you leave/arrive, it’s about 2.5 hours from port to port. But you also need to take into consideration the time it takes to get to the port from where you are staying in Bali. 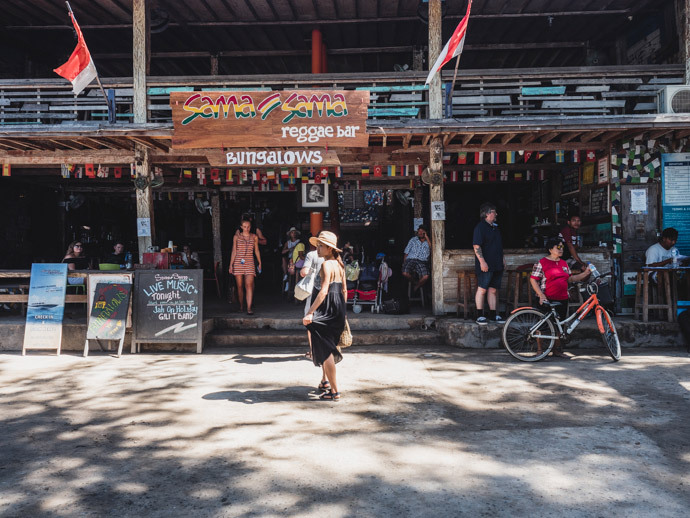 We generally like to say that it will take half a day so make sure you have enough time in your Bali Itinerary to really explore the Gili Islands. You can also fly from Bali to Lombok to reach the Gili Islands. 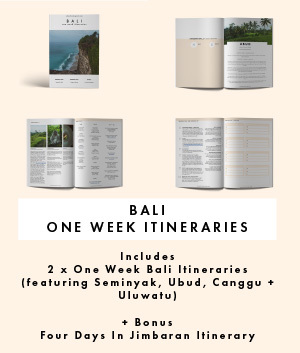 I would only recommend this if you are exploring Lombok too (which we recommend as it’s a beautiful island) or if it’s a time of year where the sea conditions are poor. That’s because Lombok airport is not close to the Gili Islands, so once you arrive in Lombok, you still need to get a 2-hour taxi to the harbour and then a 15-minute speedboat to the Gili Islands. So we are going to focus on how to get to the Gili Islands from Bali by boat. First, you will need to decide which departure point is best for you. 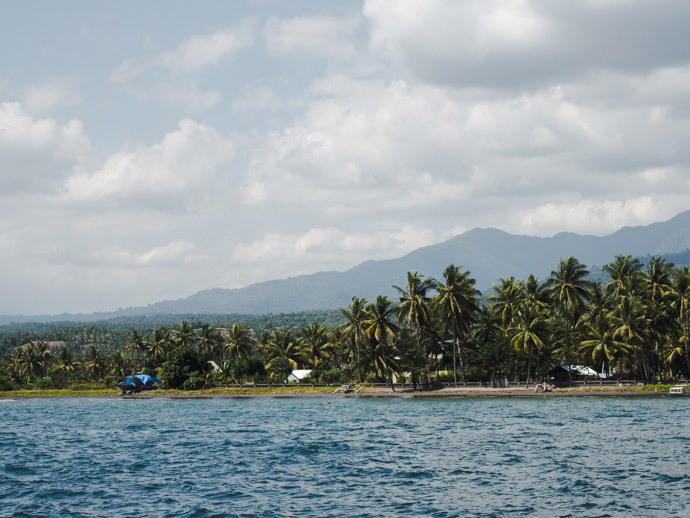 If you are going to be in South Bali, then Serangan would be your best departure point. Serangan is near Nusa Dua and Sanur. So, for example, how to get to the Gili Islands from Seminyak? You would get a ticket from Serangan to either Gili Trawangan or Gili Air. 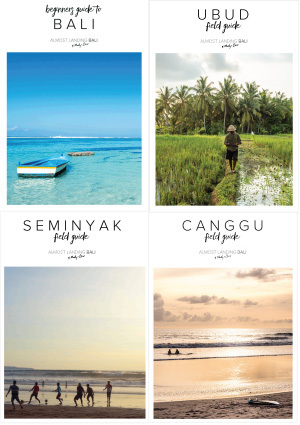 If you were staying in Ubud, Candidasa, Sidemen, Amed, or anywhere in central or northern Bali, then Padang Bai is probably your best departure point. Keep in mind it might still take some time to reach Padang Bai, but certain locations may have free pickup included in their ticket. If you want to leave from Serangan and then come back through Padang Bai, that is also possible. And if you’re considering including Nusa Lembongan in your Bali Itinerary, then you can also get to the Gili Islands directly from Nusa Lembongan. We have used Blue Water Express on 5 separate occasions and have had great experiences. They are a little more expensive than other companies, but they provide a great service so we are always happy to book with Blue Water Express. 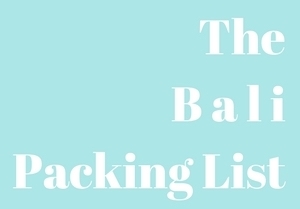 Of course, make sure to do your own research so you feel comfortable with your choice. I would recommend booking your ticket online in advance. The prices vary depending on which company you choose. With Blue Water Express the price of a one-way ticket from Bali To The Gili Islands is 790 000 IDR, which is approx. $73 AUD. We started by heading the Blue Water Express check-in desk, which is located at the back of Sama Sama Reggae Bar. We checked in and had our bags tagged. They help a lot by getting your bags on and of the boat which is great. We then waited on the beach for our boat to arrive. When it does you just head up a small ladder, rinse your feet and head inside the boat, ready for your trip to Bali. On this trip we stopped off at Lombok mainland and from here it was straight to Padang Bai. If you are heading to Serangan, then you will be lucky last :). Padang Bai was even busier than we remembered it, but we were directed to our minibus by Blue Water Express staff. 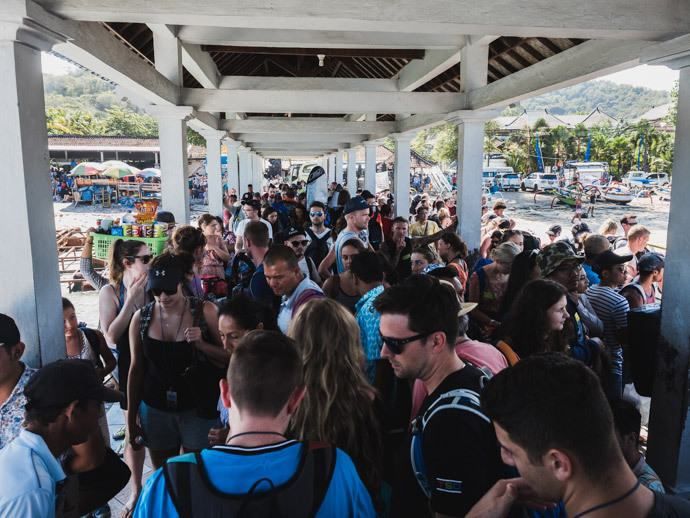 It was certainly good to have our transport from Padang Bai to Ubud already organised, as it would have been overwhelming to try and organize it by yourself. Journey Route: We travelled from Gili Trawangan to Padang Bai Bali, which was direct. 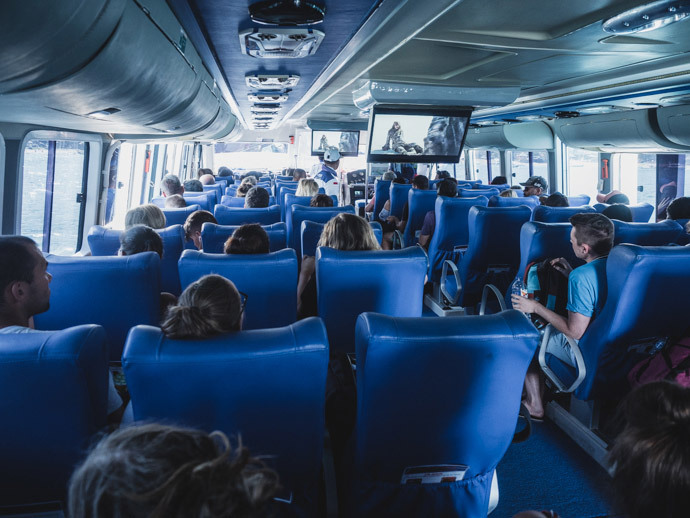 From Padang Bai, Blue Water Express offer a shuttle (included in the price) to Ubud. This takes another 1.5 hours. Journey time: The estimated journey time from Gili Trawangan to Padang Bai is 1.5 hours, but our journey took about 2 hours 15 minutes. The length of the journey can vary depending on sea and weather conditions. Fast Boat Company: Blue Water Express. Fast Boat Price To/From Gili Islands: 790 000 IDR One Way (approx. $73 AUD) per person. Check prices here. Bali Departure Point: You can leave Bali from Serangan or Padang Bai. Depending on what area you are staying in, you may get picked up from your accommodation and taken to either Padang Bai or Serangan. Here you will wait at the Blue Water Express area until you board your boat. Gili Air Arrival: You will arrive at Gili Air harbour (or Gili Trawangan). At Gili Air, you will get off the boat onto a jetty and then make your own way to your accommodation. Gili Trawangan Arrival: At Gili Trawangan, you will hop off the boat into most likely ankle deep water then make your own way to your accommodation. 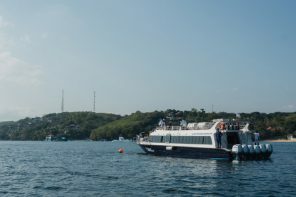 Best Sea Conditions: According to Blue Water Express, the best sea conditions, in general, are in the months of April, May, June, October, November until Mid-December. You can see Blue Water Express details here. The Experience: Our sea conditions for this trip were a little rough towards the end, but still ok. I honestly was happy when the trip was over, but it didn’t bother Chris. I would definitely try to visit the Gili Islands in the months that offer the best sea conditions. We have previously chosen to use Blue Water Express for our boat transfers in Bali and Lombok as paying customers. However, our latest trips were done in collaboration with Blue Water Express to share our experience and were courtesy of Blue Water Express. 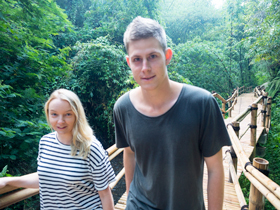 Everything we share with you is our personal experience to help you plan your trip to Bali.